- an instrument used for cutting cloth, paper, and other thin material, consisting of two blades laid one on top of the other and fastened in the middle so as to allow them to be opened and closed by a thumb and finger inserted through rings on the end of their handles. 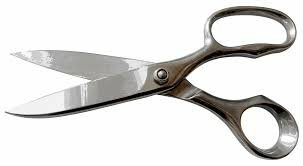 According to Wikipedia, scissors were invented in ancient Egypt around 1500 BC. Early scissors from Mesopotamia were a spring type with two bronze blades connected by a thin, flexible strip of bronze curved to hold the blades in alignment. This design allowed them to be squeezed together, and they would then pull themselves apart when released. This scissors design was used in Europe until the 16th century. The design we know today has developed from that of the Romans around 100 AD. But enough history. As the dictionary definition states, scissors are basically two knives strategically connected together to allow them to pivot, creating the cutting action. Over time, scissors dull with use. If they are relatively inexpensive, you could go out and buy another pair, but why, when they can be sharpened again to be as good as new? In our throw-away-world, many may throw away their dull scissors just to save the trip to the quilt shop for sharpening, but if you are like us, you prefer to get your money out of whatever you own. With our sharpening services, we can help you extend the life of your scissors and make them cut just as they did when they were brand new! It doesn’t matter the size or style – we can sharpen them all, and we sharpen any sewing scissors for only $7 per pair. Call Ron at 956-638-1961 or email ron@ablockaway.com.